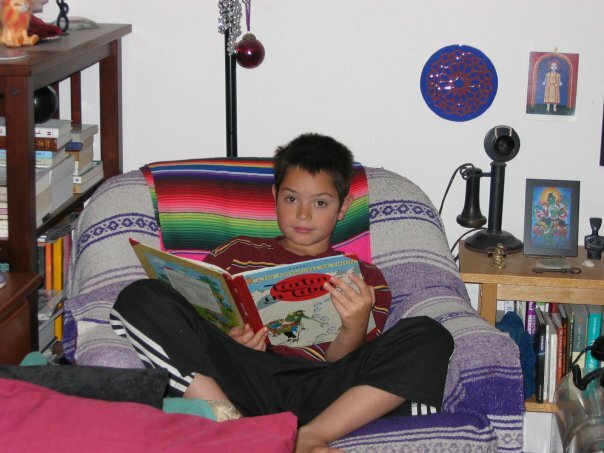 Ethan Reading Tintin at Uncle Paul’s house, a really long time ago. Reading is always a good idea! This was a wonderful novel, painful and rich and intense and beautiful and I highly recommend it. I don’t want to tell you anything about it though. I am a Card fanatic and read all his books voraciously. I was not disappointed with this magical novel full of real teenage and human drama along with lots of magic and mystery, intrigue and fantasy. I was not ready for it to end. Excellent story told from the eyes of a young girl in a difficult family and situation in Wales not too long after World War II. Very lovely, lyric, tragic yet hopeful as well. A good read, hard to put down. Tepper is another one of my favorite authors. This fantasy/science fiction is set many thousands of years from now and I don’t want to give anything away. This was also a quick read and impossible to put down. This is a memoir by a woman whose mother was a brilliant musician, and also mentally ill, homeless and dangerous to her and her sister. It’s the story of their lives and how she remembers it while her mother is dying. Both her and her sister find their mother after fifteen years of not seeing her and spend the last month of her life taking care of her and helping her to die in a safe, warm place. Very painful, but stunning writing and amazing clarity of memory recall. The book is full of pictures, not real ones, but ones that you see as the author tells the story. It’s a visual read, without visuals. Historical fiction about Samson and Delilah. Told with accuracy for historical details more than biblical ones and interesting and lovely as well as the story of love between two Priestesses/Sisters. Very enjoyable. Ender’s Shadow, Speaker for the Dead, Shadow of the Hegemon, Shadow Puppets, Shadow of the Giant all by Orson Scott Card. I love all of these books and went on a wild re-read of them. If you haven’t read Ender’s Game and all the books which follow from it, you are missing out on extraordinary fiction. On a Harry Potter kick, will probably read through all of these again. They are fun reading. This book recommended to me by Betty Braver. I have enjoyed other books by Allegra Goodman and this was a wonderful read. Set in SF and also New York and Connecticut, dealing with the dot.com bubble, an old/rare bookseller and book collection and the 9/11 tower bombs and their aftermath in the lives of two sisters. Great story, well wrought. I got it out of the library and have returned it, so it’s yours to go get and read NOW. hmmmm, what to say. I read this book but never completely got into it. The characters are interesting but the intrigue and complexity, while all too real and accurate dealing with Guatemala and death squads, orphans and complicated love was just a little too windy a path. You may enjoy complex, gruesome and long narratives, not my favorite thing though. Thanks so much for the suggestions. There is truly no pleasure in the world as glorious as reading a marvelous novel, is there? I think I’ll find some on your list!